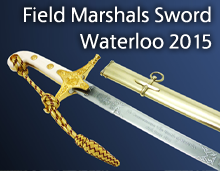 Based on the 1822 Light Cavalry pattern, this sword features a slightly curved and spear-pointed carbon steel blade. 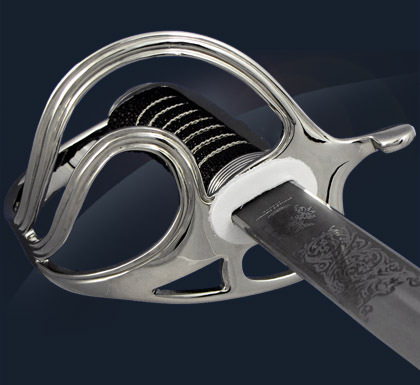 The hilt is a half-basket in nickel-plated steel with three fluted bars and a grip in black fish-skin bound with silver-plated copper wire. The pommel is a stepped design. This sword is available with a leather scabbard with Sam Browne fitting or with rings, or a nickel-plated steel version with rings. Contrary to popular legend, General Sir Samuel Browne VC did not invent the belt that carries his name to assist one-armed handling of his sword (he lost his arm only several years later). The new pattern in fact solved the problem of carrying both sword and pistol on the same belt. It is worth mentioning that this style of belt had been prevalent with Indian Army Officers since 1857 as had the wood leather covered scabbard. 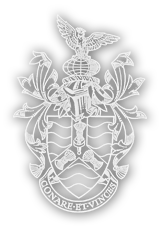 The Sam Browne was officially authorized in 1899 for active service wear by officers of all branches of the British Army. Since then, its design has been adopted by virtually every army in the world. The Sam Browne scabbard is made of wood and covered with leather glued and stitched on by hand. It incorporates a thick leather shoe, a metal mouthpiece and a "frog-strap" which attaches to a "frog" or button on a Sam Browne belt. This avoids the problems of fixing carrying rings to the leather scabbard and makes it easier for the sword to be removed with one hand. The Royal Regiment of Artillery do not wear a Sam Browne, therefore, the leather scabbard is fitted with nickle-plated rings, for attachment to slings held in place by the belt under the uniform.